Well here we are again, one week after the last update, so much for my plan to be more prolific with this. In a lot of ways this was a fairly quiet week for Janet. No weddings, no road trips, no huge signs of progress that warranted an immediate blog update. When I look back at my notes though, its clear it was a good week. 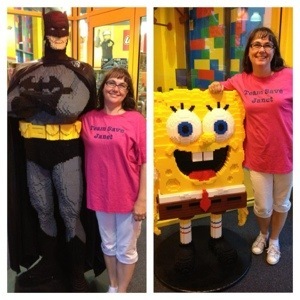 Janet continues to show massive improvement in her cognitive abilities, especially with short term memory. She more frequently knows my name now although this week I’ve been Dennis, Bert, Julie, Ralph and Ted but mostly Larry. When asked now, I see Janet thinking before speaking rather than blurting out the first thing that pops into her head. A few times she’s even said “I forget” instead of calling me something she knows is wrong. We can now talk about events that took place in the morning with Janet able to describe a little bit about them and if the event was big enough she can even talk about something a day or two before hand. Her memory is not yet filing things in chronological order as evidenced by an emotional outburst one day when she thought for sure Laurel and or Heather were to be visiting her. She was so sure of it she called Laurel and me wondering why no one was there with her. She wasn’t able to reach Laurel but the call to me consisted of lots of tears of confusion and frustration. On the flip side, when asked what she wanted to do one morning, she remembered without prompting that she wanted to reply to an email sent from her friend Annette a couple days earlier. For some reason, probably old memory, Janet insisted on hand writing a letter so I gave her a blank greeting card and a pen and left her to it. Twenty minutes later she’d managed a decent note. I could read about a third of the words she wrote which is really good considering I couldn’t read much more of Janet’s writing even before she got sick. Janet has always had a strong sense of commitment and loyalty and so the obligation to reply stuck with her. She’s not great at filling a page yet but always has a good idea of what she wants to say and is improving her typing skills each time. I’ve noticed her vision is better the more awake she is and have noticed that applies to me too. The glasses are on now. Janet was a big help in getting our house and yard cleaned up for a showing this past Saturday. For the first time she was able to vacuum on carpet and did a great job dusting some areas down for us. A sense of purpose is huge for Janet and I love seeing her eagerness to help with projects like that. Lorne had her vacuuming the living room at Connect this morning and said Janet had a smile on her face the whole time. I wish there was more I could get her to do. Yard work is great as long as Janet can reach what she’s to be working on and unfortunately most of our weeds don’t grow that tall. During the showing we went for a long walk along a route we hadn’t taken since Janet got sick. She remembered a lot of it and loved looking at all the nice homes. Nash was having trouble with the heat and distance and Janet was quite concerned about him. Thankfully he drank water from the lid of her water bottle and that comforted Janet. The thought of selling our house is dominating our time together and Janet both enjoys thinking of what the next house will be like and is somewhat reluctant to see the current one go. She’s very astute at recognizing how it doesn’t make sense to stay here much longer. My body thanks her for that. Janet’s reading skills are improving as well. Laurel and Raj sent a thank you note following their wedding and Janet read most of it to me unassisted. I could especially understand the parts she read without crying. She’s had some real emotional moments lately, I think from a greater awareness of her situation. I sense a little bit of her feeling she needs to contribute more or be able to do more for her family and doesn’t fully understand the kids are all grown up and out doing their own thing. A few times when driving home and I ask her what she wants to do she’ll respond with “whatever everyone else is doing”. She doesn’t get upset when I tell her its just her and me but for a moment I think she was back in time and there were kids living with us. Janet is living more and more in the present though and confirmed that today when I allowed her to answer a stupid call from her bank. They asked why she hadn’t reviewed her banking needs with them for over a year and if something had happened to cause that. She told them flat out, ” something big happened with my health”. The guy on the other end heard that and repeated it but couldn’t deduce that maybe that was why he had been having trouble hearing Janet for the duration of the call. She was conversing very well with him just not very loudly. Hopefully it was enough to prevent another call. The gym remains Janet’s nemesis and best tool at the same time. Her strength is gaining noticeably, especially on the Shuttle. Garret suggested a slightly different position for Janet’s legs on the Shuttle and it allows for a much longer extension, now up to thirteen inches, and Janet is able to push more weight too. She absolutely hates the Standing Frame but I think has resigned to knowing she’s got two sessions a day in it and as long as she feels she’s in control of how long she in it for she’s ok. There hasn’t been a lot of swimming lately but what Janet’s done has been good. The hot tub continues to be a happy place for her and the time when I get the best stretch of her legs and right arm. Noticing some nice improvement in her right shoulder and the Botox is working well with her finger flexors. We went to see Julie at the hand clinic for a follow up visit and she was surprised at how nicely Janet’s hand is doing. Julie did not expect to be able to adjust the splint yet but with Janet tolerating it well and her hand being nice and open, she was able to mold the splint to allow an even more relaxed position for Janet’s hand and said we don’t need to come back to see her unless something is wrong. Good news. 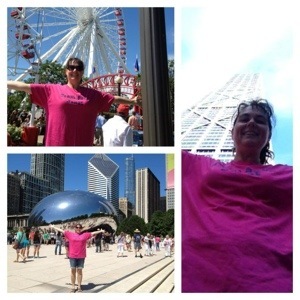 Team Save Janet has expanded into the Windy City! Thanks Brenda for carrying the colors there and if anyone else has a picture wearing your gear in a far away place I’d love to see them. Praying for Janet to keep getting stronger, especially her right leg. Praying for restoration of the use of her right arm and hand and complete restoration of her vision. Thanking our Lord and Savior for the healing he has brought and for all of you who continue to pray and support Janet and I.